drawings | Out of the Box! Whenever I go fishing, I catch everything but fish. Maybe one of these days, I will actually get lucky and hook a big one. John W. Thomason loved to fish and hunt. Nature was his greatest inspiration. He loved the outdoors so much that he quit a number of jobs and school so he could increase his time in the outdoors. In honor of the first BearKat football game of 2014 a little cartoon fun from 1951. The BearKats took on the Howard Payne Yellow jackets and won 27-19. This material can be seen in the University Archives. The image on the left is a photograph from the John W. Thomason collection. It is of soldiers marching with the American flag. John W. Thomason was stationed at the Legation in Beijing in the 1930s, so this is possibly the location of this picture. 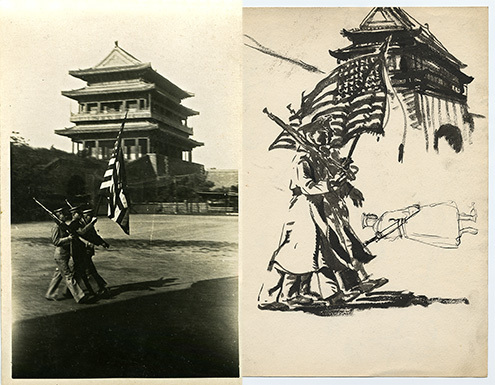 The image on the right is a sketch by John W. Thomason. It seems to have been inspired by the picture on the left. 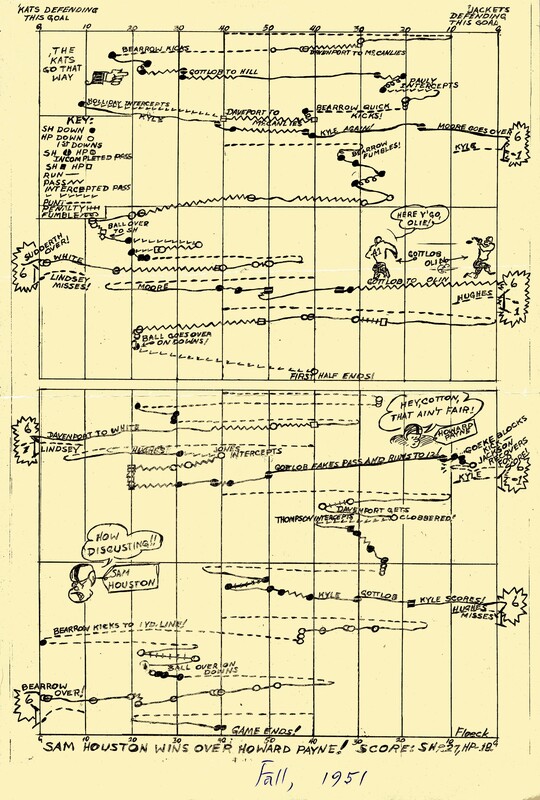 Even before leaving Huntsville, Texas, Thomason developed a habit of recording his surroundings in his drawing notebooks or on whatever scrap of paper he had nearby — which accounts for the large collection of diverse drawings held at Sam Houston State University. You never know what you may find on a beach. Sure, it will probably be a bottle cap or a discarded puka shell necklace, but we can still dream. So enjoy this John W. Thomason drawing and think of looking for buried treasure the next time you are at the beach. This work comes from the drawings of John W. Thomason. Newton Gresham Library houses over 2,000 pieces of his work including a number of landscapes. Watch as this guy rows his way across a river in a John W. Thomason drawing. This gif was a huge hit on Tumblr and has received over 1,700 notes. We were also featured on Tumblr Radar because of the gif. Needless to say, We were honored and surprised. Happy Birthday to John W. Thomason! The namesake for our Special Collections department was born on this day in 1893. John W. Thomason, Jr. was born into a prominent family in Huntsville, Texas. He was the eldest of nine children. His forebears were doctors, plantation owners, and military officers. 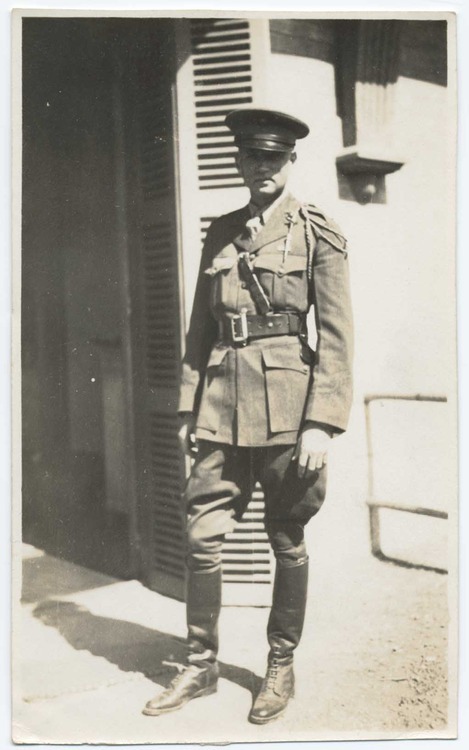 A love of the land was no doubt a major part of Thomason’s ethos; had not World War I led him into his military career, the life of a southern squire with cultured avocations would have satisfied his artistic and literary inclinations. After several years of higher education at Southwestern University, Sam Houston Normal Institute, and the University of Texas, interspersed with brief stints of teaching school, Thomason persuaded his mother to endorse a year of study at the Art Student’s League in New York in order to develop his obvious talent. He then returned to Houston to teach in a private school. A family friend, Marcellus E. Foster (“Mefo”) who was editor and owner of the Houston Chronicle offered him a job as a reporter, affording him a boost to his writing career. When the United States entered World War I on April 6, 1917, that same day Thomason crossed the street to the Rice Hotel to enlist in the Marines. The years of indecision were over, for Thomason had found his niche. He had a distinguished career as a Marine officer (his book, Fix Bayonets!, is still a revered work to Marines and World War I enthusiasts). His military postings took him to Cuba, Nicaragua, and China, as well as to Washington, D.C. and some shorter assignments. The exotic locales are reflected in the vivid writings that made him one of the best-known authors of this day; he is also immediately recognizable as a talented artist by the sketches that adorn his numerous books, as well as books of other authors who sought out his illustrative skills. Colonel Thomason died March 12, 1944. Thomason Drawings come to life. 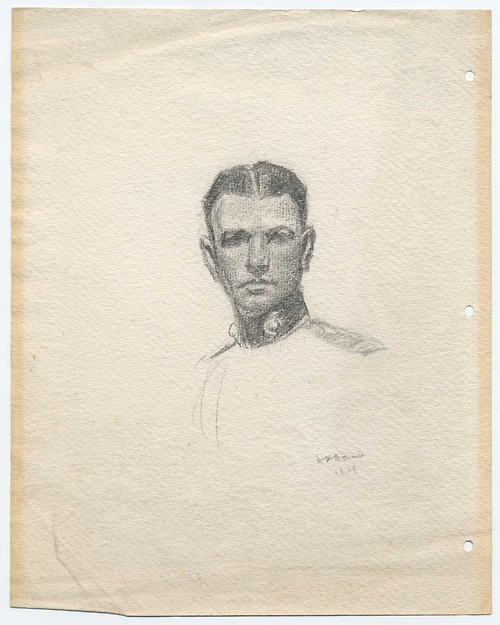 I have turned this Thomason drawing found in our collections into a fun GIF. Check it out on our tumblr.